The idea for a recreational lake in Wabaunsee County was conceived in the 1920s and - with the help of Federal New Deal programs - finally became a reality in the late 1930s. Lake Wabaunsee's grand opening was held on August 26, 1939. A single paved roadway encircles the New Deal-era lake and includes two historic stone arch bridges. The construction of the three-arch stone bridge took place in 1937 and 1938 and was funded by the Works Progress Administration. 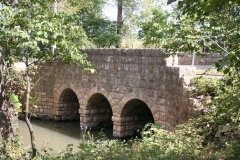 This bridge is nominated individually to the National Register as part of the "Masonry Arch Bridges of Kansas" and "New Deal-Era Resources of Kansas" multiple property listings. Today, lakefront houses dating from the middle and late 20th century dot the perimeter. New Deal-era camp buildings are no longer extant and modern development prevents listing the entire lake site in the National Register. The Southeast Bridge remain an integral part of the historic road system encircling Lake Wabaunsee. The Stuewe House is significant for its association with the early development of Alma and as the location of the Stuewe Brothers Creamery. Brothers Albert and Ferdinand Stuewe purchased a small limestone house (c. 1873) on the west edge of Alma in 1884 where they operated their creamery and cattle businesses for fifty years. 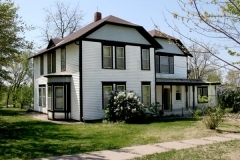 The current appearance of the house dates to 1885 when the brothers built a two-story addition. 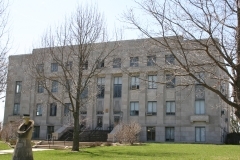 Albert and Ferdinand, who established the Bank of Alma (later renamed Alma State Bank) in 1895, were community leaders who played significant roles in the development of Alma. Ferdinand served as Wabaunsee County Treasurer, State Representative, and was president of Alma State Bank. The property remained in the Stuewe family until the 1960. 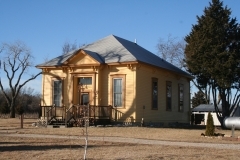 Early Wabaunsee County settler Peter Thoes established his home and farmstead shortly after the Kansas Territory opened for settlement in 1854. It was near the Pottawatomi Indian Reserve, which at that time occupied about one-third of what is now Wabaunsee County. It was one of a cluster of properties that took root before the Civil War and the founding of Alma, and even vied for the location of the county seat. Thoes lived on and farmed this same property until his death in 1894. The sprawling and iconic barn on Thoes' property was built in phases from the late 1870s to the early 1890s. It is situated on a farmstead that includes Thoes' stone residence and a few later outbuildings, which are owned separately from the nominated barn. The house burned in 1922, was partially rebuilt, but has been altered considerably in recent years and is not eligible for listing in the National Register; the barn is the primary extant resource associated with Thoes. 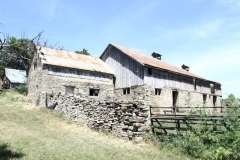 The barn was nominated as part of the Historic Agriculture-Related Resources of Kansas multiple property nomination in the areas of agriculture and exploration/settlement for its association with Peter Thoes. This 19th-century school is located in the original town site of Wilmington. It is the oldest remaining structure. 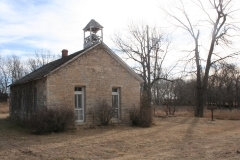 Local resident Andrew Pringle, Sr., built the one-room stone schoolhouse in 1870 from limestone that was quarried within a few miles from the structure. The property is nominated for its associations with public education and for its potential to yield additional information through archeological investigation.